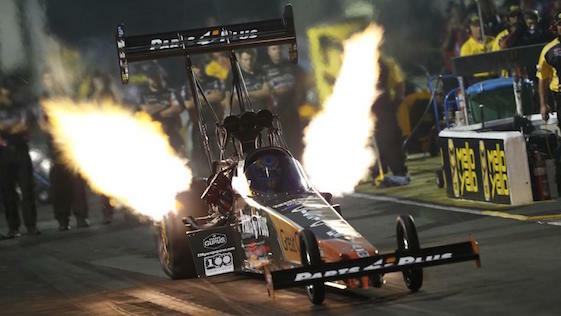 Clay Millican secured the pole in Top Fuel in Bristol. Millican laid down his pole-winning run of 3.817-seconds at 322.88 mph during his second qualifying pass on Friday. The defending event winner notched his fifth No. 1 qualifier on the season, as he sets his sights on his third event victory in the past four events. Millican will face Terry Totten in the first round of Sunday’s eliminations. Tony Schumacher slotted into second in Top Fuel qualifying with a 3.830 at 323.66 in his U.S. Army dragster as he prepares for Terry McMillen in round one. Force remained atop the Funny Car category lead with a pass of 3.993 at 325.92 in her Chevrolet Camaro recorded during her second qualifying run Friday, as she was the only driver in the class to run under the four-second mark during the two days of qualifying. The current points leader secured her seventh pole of the year and fifth in the past six events. Force will face off against Jonnie Lindberg in the first round. J.R. Todd sits in second with a 4.072 at 313.15 in his Toyota Camry during the second qualifying session on Friday, as he is slated to take on Del Worsham on Sunday. Anderson held on to the lead in the Pro Stock class after driving to a 6.674 at 205.35 in his KB Racing Chevrolet Camaro during his second pass on Friday. The four-time world champion locked in his seventh No. 1 qualifying spot of the season and the 100th of his career. Anderson will take on Wally Stroupe in the first round of eliminations. Jeg Coughlin Jr. finds ended up qualifying second following his 6.683 at 205.22 in his JEGS.com/Elite Performance Chevrolet Camaro during the second session on Friday. Eliminations begin at 12:00 p.m. on Sunday at Bristol Dragway. BRISTOL, Tenn. — Sunday’s first-round pairings for eliminations for the 18th annual Fitzgerald USA NHRA Thunder Valley Nationals at Bristol Dragway, the 11th of 24 events in the NHRA Mello Yello Drag Racing Series. Pairings based on results in qualifying, which ended Saturday. DNQs listed below pairings. Top Fuel — 1. Clay Millican, 3.817 seconds, 322.88 mph vs. 16. Terry Totten, 6.899, 84.96; 2. Tony Schumacher, 3.830, 323.66 vs. 15. Terry McMillen, 4.724, 159.34; 3. Antron Brown, 3.832, 319.67 vs. 14. Richie Crampton, 4.626, 169.81; 4. Scott Palmer, 3.863, 319.82 vs. 13. Bill Litton, 4.111, 302.82; 5. Brittany Force, 3.875, 320.20 vs. 12. Doug Kalitta, 4.091, 243.81; 6. Steve Torrence, 3.879, 321.81 vs. 11. Shawn Reed, 4.019, 263.62; 7. Dom Lagana, 3.886, 321.19 vs. 10. Pat Dakin, 4.002, 306.53; 8. Mike Salinas, 3.917, 314.97 vs. 9. Leah Pritchett, 4.001, 296.31. Funny Car — 1. Courtney Force, Chevy Camaro, 3.993, 325.92 vs. 16. Jonnie Lindberg, Ford Mustang, 4.771, 202.82; 2. J.R. Todd, Toyota Camry, 4.072, 313.15 vs. 15. Del Worsham, Camry, 4.335, 231.91; 3. Robert Hight, Camaro, 4.077, 316.97 vs. 14. Jeff Diehl, Toyota Solara, 4.298, 290.13; 4. Bob Tasca III, Mustang, 4.078, 312.06 vs. 13. Tim Wilkerson, Mustang, 4.262, 251.81; 5. Cruz Pedregon, Camry, 4.109, 304.05 vs. 12. Jim Campbell, Dodge Charger, 4.215, 295.98; 6. John Force, Camaro, 4.115, 313.51 vs. 11. Ron Capps, Charger, 4.193, 301.07; 7. Jack Beckman, Charger, 4.130, 307.86 vs. 10. Shawn Langdon, Camry, 4.191, 299.00; 8. Tommy Johnson Jr., Charger, 4.167, 303.03 vs. 9. Matt Hagan, Charger, 4.188, 296.24. Did Not Qualify: 17. Terry Haddock, 9.984, 92.31. Pro Stock — 1. Greg Anderson, Chevy Camaro, 6.674, 205.44 vs. 16. Wally Stroupe, Camaro, 7.552, 133.18; 2. Jeg Coughlin, Camaro, 6.683, 205.26 vs. 15. Tommy Lee, Camaro, 7.012, 195.39; 3. Drew Skillman, Camaro, 6.685, 204.82 vs. 14. Alan Prusiensky, Dodge Dart, 6.866, 201.49; 4. Tanner Gray, Camaro, 6.688, 205.60 vs. 13. John Gaydosh Jr, Chevrolet Camaro, 6.800, 203.12; 5. Alex Laughlin, Camaro, 6.692, 203.58 vs. 12. Tim Freeman, Camaro, 6.744, 203.46; 6. Jason Line, Camaro, 6.700, 204.57 vs. 11. Erica Enders, Camaro, 6.710, 205.26; 7. Deric Kramer, Camaro, 6.703, 205.22 vs. 10. Chris McGaha, Camaro, 6.706, 206.13; 8. Vincent Nobile, Camaro, 6.703, 204.08 vs. 9. Bo Butner, Camaro, 6.704, 205.07.